Figure 3. Immunohistochemical staining of MyoD. (a)–(c) Control group 7, 14, and 21 d after surgery, respectively. 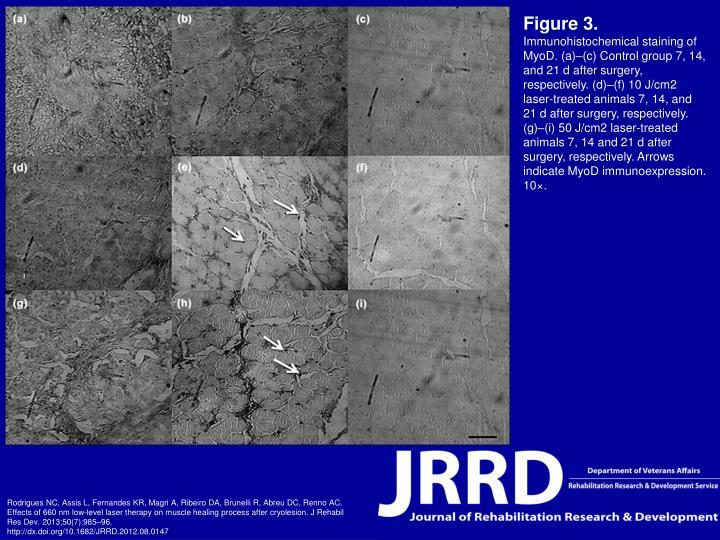 (d)–(f) 10 J/cm2 laser-treated animals 7, 14, and 21 d after surgery, respectively. (g)–(i) 50 J/cm2 laser-treated animals 7, 14 and 21 d after surgery, respectively. Arrows indicate MyoD immunoexpression. 10×. Rodrigues NC, Assis L, Fernandes KR, Magri A, Ribeiro DA, Brunelli R, Abreu DC, Renno AC. 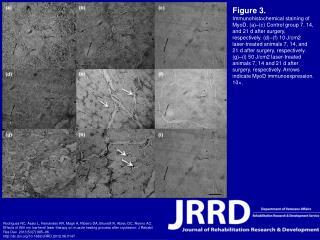 Effects of 660 nm low-level laser therapy on muscle healing process after cryolesion. J Rehabil Res Dev. 2013;50(7):985–96.